I am so deeply saddened by the death of Gary Stewart, a veteran music and recording executive who had a lifelong devotion of service to the music in any capacity he held, starting out at Rhino Records (later Rhino Entertainment, where he became senior VP of A&R) and later at Apple iTunes. 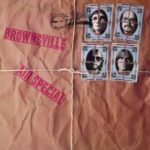 Brownsville Station hit the big leagues with the success of “Smokin’ in the Boy’s Room” (#3) and “Kings of the Party” (#31) in 1974, but by 1976, they were in a lull. With their recent Motor City Connection album failing to chart and a parting of ways with their label, Big Tree, the trio format (adopted after their second album) had seemingly run its course. They needed a lift and got in the form of a new label (Private Stock) and especially the addition of second guitarist Bruce Nazarian, a monster player who’d been on countless Detroit soul records. Morale may have been down, but the chemistry was intact when they recorded their next album for Epic Records, 1978’s Air Special. Another hotshot producer, Tom Werman (of Cheap Trick and Ted Nugent fame, among others) was at the helm—giving the resulting album a big arena rock feel, with the drums of Henry “H-Bomb” Weck in particular booming in the mix (thankfully not ’80s-style). Much to their chagrin, the band were also forced to record Hello’s recent hit, “Love Stealer” (ironically, penned by Phil Wainman, also the coauthor of “Lady” from the previous album) as a gambit to get on AOR radio. 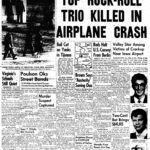 February 3, 2019 is the 60th anniversary of tragic airplane crash that subsequently became known as “The Day the Music Died,” sadly referenced in Don McLean’s song, “American Pie.” Buddy Holly, Ritchie Valens and J.P. Richardson a.k.a. The Big Bopper died along with pilot Roger Peterson. After a February 2, 1959 “Winter Dance Party” show in Clear Lake, Iowa, Buddy Holly, Ritchie Valens and J.P. Richardson took off from the Mason City airport, in a three-passenger airplane that Holly chartered piloted by Roger Peterson during inclement weather. It crashed into a cornfield in nearby Macon City, Iowa, just minutes after takeoff. I will always remember the February 3, 1959 front page headline in The Los Angeles Evening Mirror-News, a daily newspaper who reported this accident. Ritchie Valens’ death was a very big regional loss. He was from Pacoima, a suburb in Southern California. Ritchie’s records were very popular in Los Angeles and the surrounding communities. It was KFWB-AM deejay Gene Weed who first spun his music and the radio station held what seemed like an all-day shiva celebrating the life of Valens, whose record label, Del-Fi, was based in Hollywood.